So please begin at Lorby's World http://lorbysworld.blogspot.com since she is our hostess and has a give away going on with this hop. She has all the details on her blog. 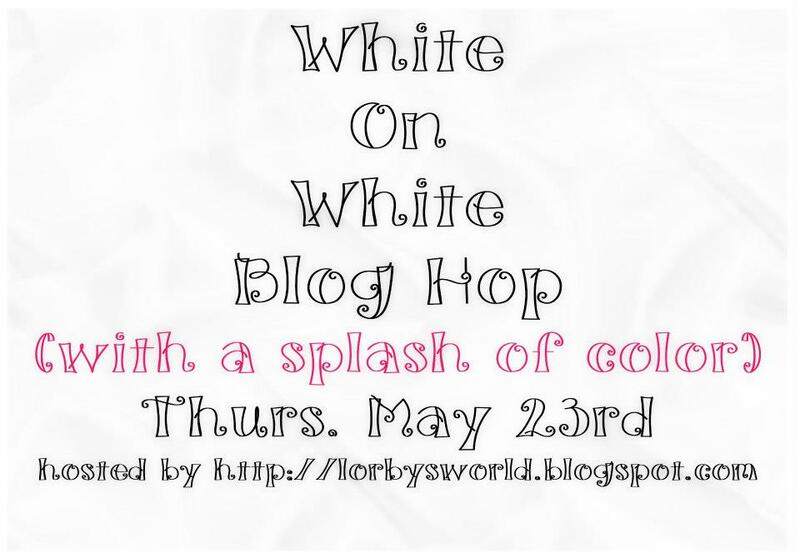 Our guest hostess is Tee http://tee-myspot.blogspot.com/2013/05/white-on-white.html and she is offering a give away from The Cutting Cafe who is our sponsor this month. Please visit The Cutting Cafe http://thecuttingcafe.typepad.com/the_cutting_cafe/ to see all their beautiful printable and cutting files. Now let's begin this hop. Here is my project to share. Cartridges used CTMH Artist and Art Philosophy, Kate's ABC's and Lacy Labels. One at 4 inches and embossed with Victorian cuttlebug folder and the second at 3.5 inches. The butterflies and their layers were cut from Kate's ABC's at 2 inches I used the Swiss dot folder on the wing first wing layer and used the deboss side, the top wing layer and the body are covered with "Diamond" stickles.The roses were cut from CTMH Art Philosophy at 2 ", 1.5" and 1.25" the tips of the petals have a smidge of the "diamond" stickles. The swirl on top of the leaves was cut from the Art Philosophy cartridge at 1" and Diamond stickled as well. The card measures 5" and the base mat is 46/8 " embossed with a folder I don't know the name of . I edged everything with a hint of silver ink from Martha Stewart. The sentiment is from a set by "My creative Time"
Thank you for stopping by today and your next stop to visit is Anita and Bugs. Hope you have enjoyed your tour and have been inspired to create a "White on White " piece of your own. PS Here is a list of all the hops just incase you got lost!! Wow! Breathtaking card. Thanks for sharing. You are very good at the rolled flowers. I can never get them to look that nice. Love the stickling! It's so much fun. Absolutely Beautiful! Thank you for sharing your technique and the cartridges you used! I Love It! Gorgeous card. Love the the embossing, flowers, butterflies and the rest of your die cuts. Great job! How very inspirational! love the combination of butterflies, flowers, and a very pretty bow. Such a beautiful card! I so wanted to make mine all white on white with no other colors but just couldn't do it. You did it and so perfectly too. Thanks for joining me in this hop.